Dr. Hall began whitening teeth when it was a relatively unknown treatment back in 1985. In 1991 he published his landmark research demonstrating that there was no advantage to etching the teeth, that it didn’t enhance the whitening process. This widely quoted research helped open the door to simpler tooth whitening techniques. There are what we call over-the-counter tooth whitening techniques. Some of them, like Crest Whitestrips, do work, but they are very weak, and they have other drawbacks. Professionally supervised home tooth whitening, however, is simple, relatively inexpensive, and extremely effective. We’ll explain that technique here. The cosmetic dental office will take impressions of your teeth and from the impressions will make custom clear plastic trays that will fit precisely over your teeth. You place a gel in this splint and wear it for certain prescribed periods during the day, or overnight. Do this for two to four weeks or more, and your smile will be brighter, possibly dramatically so! The cosmetic dentist may monitor your progress with a short follow-up appointment. Many cosmetic dentists recommend the Nite White and Day White gels, but there are other brands of tooth whitening gel that are also very effective. This take-home tray technique is very effective. There are Zoom whitening and laser whitening treatments that are faster, but they will not whiten any more thoroughly. If you have severe stubborn stains, we recommend the at-home treatments and continuing to do them for several months. Many cosmetic dental offices offer Zoom whitening, and this technique is quite popular. You can read what we say about this. It is a faster technique and is more convenient for many lifestyles. But you can get the same results with the tray technique—it just takes longer. It makes your teeth whiter permanently. Remember, however, that you are continuing to expose your teeth to stains such as coffee, cola drinks, and highly pigmented fruits, and your teeth will continue to absorb those stains. But once you have done the whitening treatment, your teeth will always be whiter than they would have been. Compare it to bleaching a yellow shirt. Bleaching permanently whitens the shirt, but it doesn’t prevent it from continuing to get dirty. Keeping your teeth their brightest requires only minor touch-up treatments every year or two. If you have trays, simply keep those trays and buy refills of the gel to use for a couple of days every year or two. It is easier than dental bonding or porcelain veneers. It costs considerably less than bonding or veneers. With tooth whitening, nothing artificial has to be attached to your teeth. You are left with your own, natural, unrestored teeth. It is unquestionably effective. 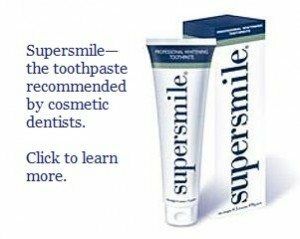 It always whitens your teeth, and usually quite noticeably, and you can control the results by how diligent and persistent you are with the treatments. You can continue to bleach as much as you like by purchasing refill kits of the gel. It’s somewhat unpredictable. With bleaching, it isn’t possible to predict exactly how much it will whiten your smile. If you get porcelain veneers, you can pick the color you want. Since you are doing this by yourself at home, that introduces another level of unpredictability. If you don’t follow the directions, you could run into problems or not get the desired results. So you have to follow the directions. You do have to put personal effort into this. You may prefer to have a professional do everything for you. Dark tetracycline-stained teeth will be whitened somewhat, but they won’t be sparkling and natural-looking. For tetracycline stains, we recommend porcelain veneers. Effective teeth bleaching requires that the whitening agent penetrate the tooth through the enamel to the underlying dentin. The enamel of a tooth is very translucent, and even the dentin is somewhat translucent. When a tooth is dark, the darkness is almost entirely in the dentin. That’s why anything that is merely brushed on your tooth won’t change the intrinsic color of the tooth. A tooth whitening agent has to soak deeply into your tooth, and that takes time. The color change is actually accomplished by free elemental oxygen, which oxidizes the stain, thus permanently removing it. The oxygen is released from a compound called a peroxide. Most tooth whitening gels contain carbamide peroxide, but some contain hydrogen peroxide. And, the greater the concentration, the greater the bleaching effect. The limitation comes in the irritation caused by the peroxide. The higher the concentration, the greater the irritation. The peroxide gels are made as concentrated as possible without causing irritation of the tooth or soft tissues. So tooth whitening requires that the gel remain on the teeth for a period of time. To accomplish this, a custom-fitted tray is constructed to fit your teeth. The tray keeps the gel in contact with the teeth. Trays made professionally in a dental office are also trimmed to keep the gel off the gums if possible to keep the irritation effects to a minimum. The gel is placed over your teeth and you wear the tray for a period of time. Twenty minutes is a minimum time to allow the gel to penetrate the teeth—thirty minutes is better. Overnight gels obviously remain on the teeth for hours. This contact is repeated over a period of days for maximum results. Many people try over-the-counter tooth whitening products. However, they work poorly and in some cases can damage the teeth. There is one brand of whitening toothpaste that does an excellent job of removing surface tooth stains, but toothpastes won’t whiten the internal structure. Click here for more detailed information about the teeth whitening procedure. You may want to read about laser tooth whitening. Click here for referral to an expert cosmetic dentist who is fully trained in teeth bleaching. What if I have porcelain veneers? Can I whiten those? Answer: According to recent studies, you can whiten your teeth a little if you have porcelain veneers. Teeth bleaching will not whiten the porcelain veneers themselves, but you can whiten the teeth under the veneers. 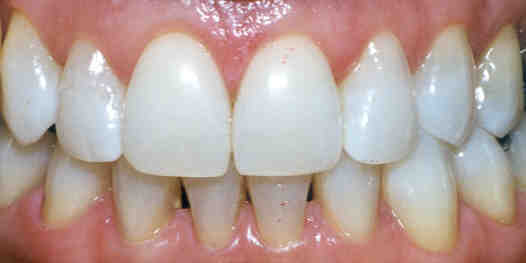 Depending on the translucency of the veneers, the whiter teeth will probably show through to some extent. Porcelain veneers cover just the fronts of the teeth—the teeth bleaching gel can still penetrate from behind the teeth. Will my teeth become discolored again after bleaching? I have a crown on a front tooth? Will tooth whitening work with a crown? My teeth are becoming very sensitive while I’m bleaching. What should I do? My teeth have tetracycline stain. Can I whiten them? Is Zoom whitening the best way to make my teeth whiter? Can I whiten my teeth while I’m pregnant or nursing? Does tooth whitening damage your teeth and gums? What to do for a discolored root canal tooth. One treatment option is internal tooth bleaching, but the results of this treatment may not be satisfactory to you. Read Dr. Hall’s blog posts about tooth whitening, where he answers questions from visitors. If you would like to be referred to a cosmetic dentist who would be expert in all of these questions about tooth whitening, please see our cosmetic dentist referral page.